When Sophie decides to go back to work 4 years after her daughter is born, she can’t help but wonder if the work/life balancing act is worth it. Strange things are going on the office, her predecessor with no real explanation, her team are fractured almost immediately and her husband isn’t all that keen on the extra hours she is having to put in, nor is her daughter. I really enjoyed this book, having read some of Edwards’ work in the past I was certain this would be a corker, and it didn’t let me down. Written in really easy to follow now and then chapters, the pace of this book is fast from the start and doesn’t let up until the very last page. I loved how Edwards’ described working in a publishing house! It gives the reader a bit of an insider view as to how this wonderful industry works, although I am certain from his note at the end that your typical publishing house doesn’t harbour murderous psychopaths (I hope!). I found that Sophie was really easy to relate to, especially as a working mother myself, her struggles are so real; the want and need to gain your independence back, to spend the day talking to adults and using your brain again is a situation I too found myself in. Sophie has a real vulnerability about her, she wants the job to work, she’s so desperate to succeed and not allow “things” to happen, that at some points she almost comes across as weak and I found myself mentally screaming at her to man up! But then thinking back to those days of feeling inadequate, of having to continually justify being at work in my head instead of at home I can see exactly why she is like she is – team that with her big secret and well, once that is revealed, you’ll understand her a lot better. 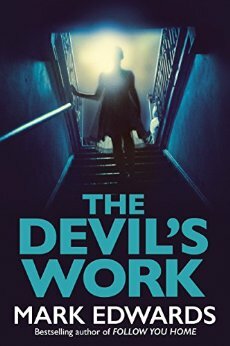 The Devil’s Work is one of those books I struggle to discuss without giving away the plot twists, but rest assured, Edwards’ builds up an intense tale which is very slick and brilliantly written, a total edge of your seat of thriller which will keep you guessing until the very end. I’d like to thank the author, publisher and NetGalley for providing me with an advanced copy in exchange for my honest review. THE MAGPIES (2013) and BECAUSE SHE LOVES ME (2014) topped the Kindle chart in the UK, as did FOLLOW YOU HOME (2015) which also was a top five bestseller in the US. My other solo novel is WHAT YOU WISH FOR (2014) and I have one short story, KISSING GAMES, available on Amazon. My next psychological thriller, THE DEVIL’S WORK will be published on 13/9/16. I have co-written six novels with Louise Voss: CATCH YOUR DEATH (2012; a #1 bestseller), KILLING CUPID (2012), ALL FALL DOWN (2013) and FORWARD SLASH (2013). We are now writing a series featuring DI Patrick Lennon. The first two books are FROM THE CRADLE (2014) and THE BLISSFULLY DEAD (2015). In total, I have sold over 1.5 million copies of my books. After a career that has taken in everything from answering complaint calls for a rail company to teaching English in Japan and being a marketing director, I now write full-time. I live in the West Midlands, England, with my wife, our three children and a ginger cat. Please note: there is another author called Mark Edwards. If a title is not listed on my author page, it’s not by me. I’ve read and reviewed this book too and it’s interesting reading someone else’s review. It’s a brilliant read isn’t it! Gave me the chills! Absolutely kept me going right to the end.